Bits and pieces of railway information of interest to me - mainly signalling and the Hutt Valley and Wairarapa Lines. The Hutt Valley is a suburb of Wellington, New Zealand. From time to time I test this site with Firefox and Opera (Linux and XP) and also with IE8. I do not have access to a Mac. I now have a video card and monitor that runs at 1600X900 but I tend to restrict the page width to about 900. I try and make my pages W3C HTML 4.01 compliant and I support the Viewable With Any Browser campaign. This is an unofficial UTW archive. 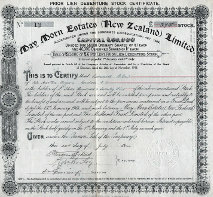 The story of May Morn Estates (NZ) Ltd is a fascinating tale of gullible investors, the construction of a light railway and how New Zealand came close to loosing the Akatarawa Forest and having major erosion problems today. The formation of the Maymorn Tramway is still walkable today. I have not done so yet but it is on my list of things to do. When I make the walk I hope to provide a kml file and other details here. Disused Cruickshanks rail tunnel is hidden in the hills north of Upper Hutt. Access to the tunnel is not particularly difficult but it is not signposted. The purpose of this page is to explain how to get to the tunnel. The rail tunnel crosses a water tunnel built in the 1850s to feed a waterwheel at Cruickshank's Mill via a water race. Some of my researches into the water tunnel are discussed. I correct a claim made in local histories. I am re-writing the page to provide detailed information about what I have called the Cruickshank's Saddle Historical Area. Astro Navigation (Astro), also known as Nautical Astronomy or Celestial Navigation (CelNav), is a means of navigation by the sun and stars. Used for hundreds of years astro became obsolescent with the introduction of GPS in the late 1980s. Today a sun or star sight can be easily reduced to find latitude and longitude with a scientific calculator, spreadsheet or phone app. In the pre-electronic era it was done manually by a variety of methods and mathematical tables. The purpose of this page is not to explain what astro is but rather to document some of its rich history, including the many sight reduction methods. This site does not provide an explanation of spherical trigonometry or the celestial sphere. Study the principles of New Zealand railway signalling with particular reference to the Hutt Valley and Wairarapa. Diagrams and photo sequences describe speed signalling, junction signalling, aspects, low-speed lights, marker lights, overlaps, advance caution, permissive working and other aspects of railway signalling. 19th century signalling extant at Masterton is explained. A page dedicated to the safe-working systems used by the New Zealand Government Railways (NZGR) and its successors. 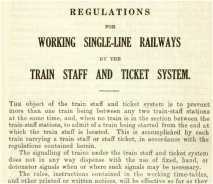 Browse various safe-working documents including the Rule Book; Electric Train Tablet; Train Staff and Ticket; Track Warrant and Automatic Signalling. PDF versions of the documents can also be downloaded. Searchlight signals have been part of the Hutt Valley railway landscape since the early 1950s. Over the past few years there has has been a project to replace the searchlight signals with LEDs. In April 2014 there were just thirteen searchlight signals extant in the Hutt Valley and five at Featherston. This page documents these remaining searchlight signals. Study the operation of specific trains in detail, with the emphasis on signalling and safeworking. 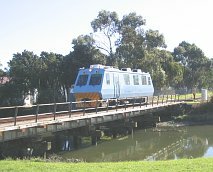 Trains described include a Red (English Electric) EMU travelling to Wellington; Bankers on the Daffodil Express; a Masterton Passenger Train running Wrong Line; Race Trains to Trentham; Q2 Gracefield Shunt; EMUs reversing at South Junction; a 25kv Electric Locomotive departing Woburn and trains to the WestpacTrust Stadium. 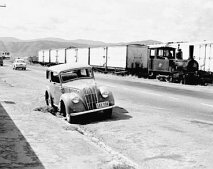 Study the history of signalling on the Hutt Valley line, including the extension of the line from Hutt Valley Junction to Waterloo, Taita and Haywards; the Gracefield Branch; and the Rimutaka Tunnel route to Featherston. Diagrams show the progression from two-position mechanical signalling to three-position upper quadrant semaphores to automatic signalling with colour light signals. Observe the extent of the interlockings once controlled by the Petone, Woburn and Taita signal boxes - very little of which now remains. An analysis of Hutt Valley timetables. The period from the opening of the Hutt Valley Branch in the 1920s until the present day is covered. 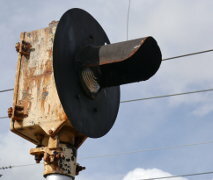 Some relics of late 19th/early 20th century signalling practice were still in regular use on the commercial railway at Masterton in 2006. 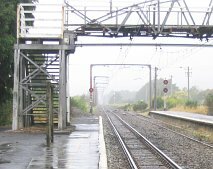 This page records Masterton signalling in 2004. 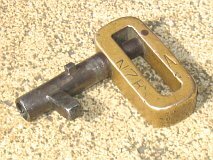 Masterton is the only location I know of where a Woods key is still used and is one of only two or three stations that have two-position signals. 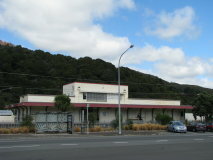 Featherston is familiar to motorists because the town marks the end of their journey over the Rimutaka Hill. Today a quiet station on the Wellington - Masterton railway, Featherston's main claim to fame is that it is where patrons on their way to the annual Toast Martinborough wine and food festival transfer from locomotive hauled Ganz EMUs to buses, to complete their journey. Upper Hutt is the terminus of electrified commuter services from Wellington. 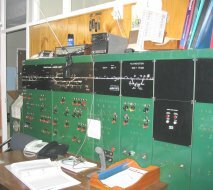 Until early 2007 it was manned 24 hours a day because the single line Trentham - Upper Hutt - Featherston section was controlled from a signal panel and time code CTC machine in the Upper Hutt station building. Study the operation and history of Upper Hutt, with emphasis on the signalling. Trentham is a single to double-line junction. The little used Racecourse Platform (loop) gives punters easy access to the racecourse. A bow-string bridge is a prominent feature of the station. I document signalling, race trains and rare workings, including a freight train using the loop. I also describe Trentham as it is for most of the year. 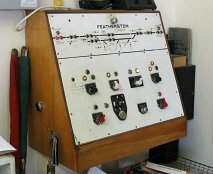 Taita signal box, dating from the early 1950s, was switched in during the morning and evening peaks, Monday to Friday, to terminate Wellington - Taita EMUs. I describe the operation of Taita Box in 2013 and provide some history. Taita Box was switched out for the final time on at 1842 hours on Friday 18th July 2014. At 0001 hours on Saturday 19th July 2014 Taita Signal Box was decommissioned. 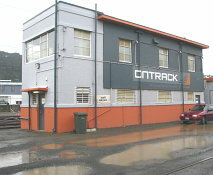 The Gracefield Industrial Line, now the Gracefield Industrial Siding, served Gracefield and Seaview. This industrial area was developed after the passing of the Hutt Valley Lands Settlement Act 1925. 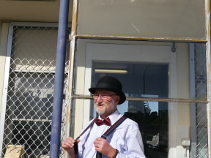 The line also served the Hutt Railway Workshops and Hutt Park Racecourse. The junction was at Woburn. Diagrams and photographs provide a historical perspective and describe the operation of Woburn and the Industrial Siding today. An introduction to the Melling Branch with a diagram providing geographical and historical perspective. The 1949 suburban steam timetable is compared with later electric timetables. Photographs show the line as it is today. Petone was one of a small number of stand-alone signal boxes extant in the network in 2013. It was switched in for just under thirteen hours per day, Monday to Friday, to signal Melling trains. It was also sometimes switched in at night and on weekends so trains could terminate at Petone during a network upgrade. Petone Box was switched out for the final time at 1835 hours on Tuesday 24th December 2013. 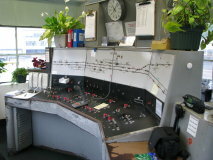 At 0600 on Thursday 26th December Petone Signal Box was decommissioned. From 1885 until 1905 the Hutt Park Railway Company carried passengers on its Esplanade railway to meetings of the Wellington Racing Club at Hutt Park. In 1915 the line was sold to the Gear Meat Company and the Hutt Park Railway Company went into liquidation in 1918. The Wellington - Johnsonville Line has some unique signalling features. Therefore, although the branch is not in the Hutt Valley, I have created a Johnsonville Line Signalling site. The site includes details current and earlier signalling practice on the branch, including starting signals at Ngaio and Khandallah to allow trains to be divided and mechanical signalling at Thorndon, Ngaio and Johnsonville. 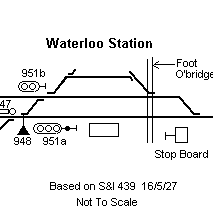 A record of the track and signalling changes at Wellington during the installation of the third track in 2009/10. Browse the text of various documents relating to Hutt Valley services. Study various track and lineside structures in detail. I have documented all extant trap points between Woburn and Upper Hutt; an Economical Facing Point Lock (FPL); the Wynn-Williams spring point mechanism; Fletcher Siding at Ava and all location cabinets between Petone and Ava. Diagrams and photographs describe these and other structures in detail. Browse various miscellaneous pages, including the BR Mk2 cars at Hutt Workshops, a residential subdivision next to a railway workshops, sightings of De508 at Palmerston North, a cab ride to Masterton, commuter train myths and a locomotive in Sri Lanka that reminded me of an Interisland Ferry. This page is also an index to the many miscellaneous images that I have posted over the past two years. 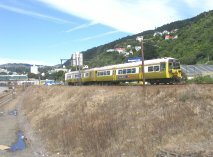 When I started this site in February 2001 I had one aim - to document passenger timetables and signalling and safeworking on the Hutt Valley Deviation Line from its opening in 1927 to the present day. After three years work I finally achieved my aim - going down many interesting side tracks in the process. I am adding information about what I have called the Cruickshanks Saddle Historical Area. In 2016 I completely lost interest in trains and seriously considered closing the site down. However I have decided to take the site in another direction, adding pages about Astro a.k.a. 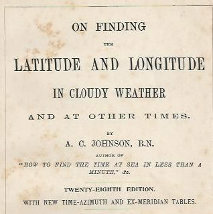 Nautical Astronomy a.k.a. CelNav and about May Morn Estates (NZ) Ltd and its light railway. This site hosts an archive of the e-magazine Under the Wires which records the last few years of Wellington's trolley buses. (Right, Upper) That is me in the very early 1970s. 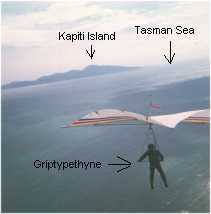 I have not flown a hang glider for forty years. (Right, Lower) I survey Petone station in 2013. This was one day before Petone Box closed permanently.